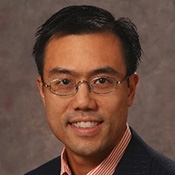 Maxwell Fung, M.D. received his A.B. degree in Human Biology from Stanford University and his M.D. from the University of California, San Francisco School of Medicine. He took his residency training in Dermatology at the University of California, San Francisco School of Medicine and his fellowship in Dermatopathology at Cornell University Medical College. Dr. Fung is an Associate Professor of Clinical Dermatology and Pathology at the University of California Davis School of Medicine, Sacramento, California. He is the Dermatopathology Program Director and Director of the Dermatopathology Service at the University of California Davis School of Medicine. He is the Dermatopathology Editor for Dermatology Online Journal and serves on the Editorial Boards of the American Academy of Dermatology DermCLIPS (Current Literature in Perspective) and the Journal of Cutaneous Pathology. Ibrahimi OA, Jim On SC, Fung MA, Eisen DB. A longstanding deep-seated nuchal tumor. Int J Dermatol. 2012 Aug;51(8):910-2. Sharon VR, Konia TH, Barr KL, Fung MA. Assessment of the 'no eosinophils' rule: are eosinophils truly absent in pityriasis lichenoides, connective tissue disease, and graft-vs.-host disease? J Cutan Pathol. 2012 Apr;39(4):413-8. Tu KL, Sharon VR, Fung MA. What on earth?! : diatomaceous earth as evidence of delusional infestation. J Cutan Pathol. 2011 Oct;38(10):761-4. Liu YC, Fung MA. Angiosarcoma with pseudoepidermotropism in a patient with breast cancer: a mimic of epidermotropic metastatic adenocarcinoma. Am J Dermatopathol. 2011 Jun;33(4):400-2. Chamber CJ, Reyes Merin M, Fung MA, Huntley A, Sharon VR. Primary cutaneous mucormycosis at sites of insulin injection. Journal of the American Academy of Dermatology 2011 May;64(5):e79-81. Garcia MS, Ono Y, Martinez SR, Chen SL, Goodarzi H, Phan T, Wehrli LN, Miyamura Y, Fung MA, Maverakis E. Complete regression of subcutaneous and cutaneous metastatic melanoma with high dose intralesional interleukin 2 in combination with topical imiquimod and retinoid cream. Melanoma Res. 2011 Jun;21(3):235-43. Bailey T, Fung MA, Gandour-Edwards R, Ellis WG, Schrot RJ. Clinical emergence of neurometastatic Merkel cell carcinoma: a surgical case series and literature review. Journal of Neurooncology 2011 Mar;102(1):147-55. Epub 2010 Jul 29. Cheng LS, Mulgrew K, Lin S, Idriss N, Eisen DB, Fung MA, Armstrong AW. A pale version. Am J Med. 2010 Sep;123(9):802-4. Sharon VR, Eisen DB, Fung MA. Cutaneous septic emboli from Candida tropicalis. Lancet Infect Dis. 2010 Sep;10(9):652. Cheng LS, Mulgrew K, Lin S, Idriss N, Eisen DB, Fung MA, Armstrong AW. A pale version. American Journal of Medicine 2010 Sep;123:802-4. DeFelice T, Fung MA, Wu JJ. A red plaque on the cheek: pyoderma faciale. Dermatology Online Journal 2010;16:7. Fung MA. “Epidermotropism” versus “exocytosis” of lymphocytes 101: definitions of terms. Journal of Cutaneous Pathology 2010;37:525-9. Epub 2010 Feb 4. Sharon V, Goodarzi H, Chambers CJ, Fung MA, Armstrong AW. Erythema induratum of Bazin. Dermatol Online J. 2010 Apr 15;16(4):1. Loh S, Bagheri S, Katzberg RW, Fung MA, Li CS. Delayed adverse reaction to contrast-enhanced CT: a prospective single-center study comparison to control group without enhancement. Radiology. 2010 Jun;255(3):764-71. Epub 2010 Apr 20. DeFelice T, Fung MA, Wu JJ. A red plaque on the cheek. Dermatol Online J. 2010 Mar 15;16(3):7. Fung MA. 'Epidermotropism' vs. 'exocytosis' of lymphocytes 101: definition of terms. J Cutan Pathol. 2010 May;37(5):525-9. Epub 2010 Feb 4. Zhang CZ, Fung MA, Eisen DB. Disseminated fusariosis presenting as panniculitis-like lesions on the legs of a neutropenic girl with acute lymphoblastic leukemia. Dermatol Online J. 2009 Oct 15;15(10):5. Saegusa J, Hsu DK, Chen H-Y, Yu L, Fermin A, Fung MA, Liu F-T. Galectin-3 is critical for the development of the allergic inflammatory response in a mouse model of atopic dermatitis. Am J Pathol 2009;174:922-931. Wadhera A, Maverakis E, Mitsiades N, Lara P, Fung MA, Lynch PJ. Thymoma-associated multiorgan autoimmunity: a graft-versus-host-like disease. J Am Acad Dermatol 2007;57:683-89. Peterson A, Katzberg RW, Fung MA, Wootton-Gorges SL, Dager W. Acute generalized exanthematous pustulosis as a delayed dermatotoxic reaction to IV-administered nonionic contrast media. Am J Roengenol 2006;187:198-201. Gettler SL, Fung MA. Efficacy of treatments for mycosis fungoides and Sezary syndrome: nationwide survey responses. Dermatology Online Journal 2005;11(3):6. Kang SH, Fung MA, Gandour-Edwards R, Reilly D, Dizon T, Grahn J, Isseroff RR. Heat shock protein 27 is expressed in normal and malignant human melanocytes in vivo. Journal Cutaneous Pathology 2004; 31(10):665-71. McNutt NS, Fung MA. More about panniculitis and lymphoma. Journal Cutaneous Pathology 2004; (4):297-9. Fung MA. Terminology and management of dysplastic nevi: responses from 145 dermatologists. Archives Dermatology 2003; 139(10):1374-5. Fung MA, Murphy MJ, Hoss DM, Berke A, Grant-Kels JM. The sensitivity and specificity of "caterpillar bodies" in the differential diagnosis of subepidermal blistering disorders. American Journal Dermatopathology 2003;25(4):287-90. Fung MA. The clinical histopathologic spectrum of so-called "dermal hypersensitivity reactions," a non-specific histologic diagnosis that is not very helpful in clinical practice: and the concept of a "dermal hypersensensitivity reaction pattern. Journal of the American Academy of Dermatology 2002;47:898-907. Fung MA, Murphy MJ, HOSS DM, Grant-Kels JM. Practical evaluation and management of cutaneous lymphoma. Journal of the American Academy of Dermatology 2002;46:325-357. Gettler SL, Fung MA. Indurated plaques on the arms of a 52 year-old man: cutaneous reaction to phytonadione injection. Archives of Dermatology 2001;137:957,962. Fung MA, LeBoit PE. Incidence of penile lichen sclerosus. [letter] Journal of the American Academy of Dermatology 2001;44;878-879. Fung MA, Berger TG. A prospective study of acute-onset steroid acne associated with administration of intravenous corticosteroids. Dermatology 2000;200;43-44. Fung MA, LeBoit PE, Maibach HI. Coalescing green and yellowpapules on the feet: focal bilirubin deposition (cutaneous bile pigment deposition). Archives of Dermatology 2000;136;113. Fung MA. Book review. American Journal of Dermatopathology 1999;21;104-105. Fung MA, LeBoit PE. Light Microscopic criteria for the diagnosis of early vulvar lichen sclerosus: a comparison with lichen planus. American Journal of Surgical Pathology 1998;22:473-478. Fung MA, Reed JA. HIV/Case Histories: Diagnostic problems: eosinophilic folliculitis. HIV Patient Care and STDs 1997;11:451-452. Fung MA, Geisse JK, Maibach HI. Airborne contact dermatitis to metaproterenol in a respiratory therapist. Contact Dermatitis 1996;35:317-318.